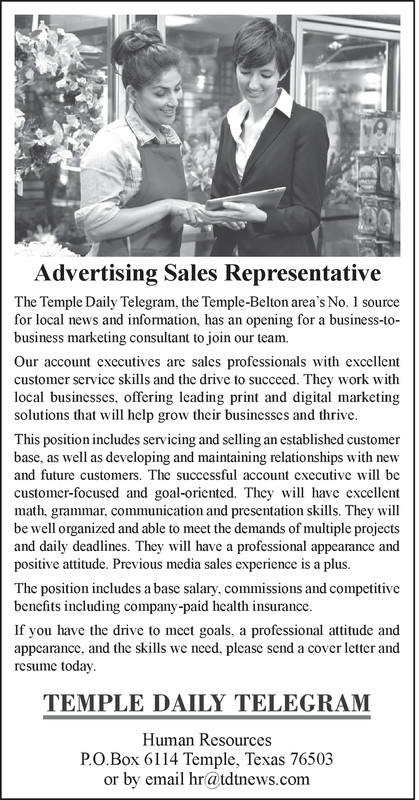 The Temple Daily Telegram, the Temple-Belton area’s No. 1 source for local news and information, has an opening for a business-to business marketing consultant to join our team. Our account executives are sales professionals with excellent customer service skills and the drive to succeed. They work with local businesses, offering leading print and digital marketing solutions that will help grow their businesses and thrive. This position includes servicing and selling an established customer base, as well as developing and maintaining relationships with new and future customers. The successful account executive will be customer-focused and goal-oriented. They will have excellent math, grammar, communication and presentation skills. They will be well organized and able to meet the demands of multiple projects and daily deadlines. They will have a professional appearance and positive attitude. Previous media sales experience is a plus. The position includes a base salary, commissions and competitive benefits including company-paid health insurance. If you have the drive to meet goals, a professional attitude and appearance, and the skills we need, please send a cover letter and resume today.